Within the brief span of a year, from Spring 2015 to Fall 2015, the Barnard contingent faculty has gone from talking about the need for a union to voting one into place. 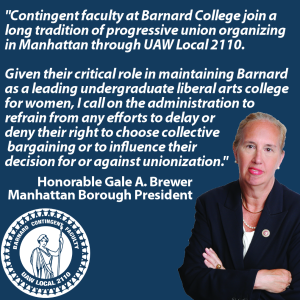 The early organizers affiliated with UAW Local 2110 because of its deep roots in the community: Local 2110 already represented Barnard support staff, Columbia support staff, Columbia graduate student workers, and NYU graduate student workers, among many others. Spring 2015: A core group of faculty organizers fanned out across campus and held scores of one-on-one and small group meetings with our colleagues. Realizing that the desire for a union was strong, we launched a card drive in the final weeks of that semester, quickly amassing confidential signatures from a supermajority of the contingent faculty, representing all ranks and nearly all departments. Summer 2015: Early in the summer, we notified the President and Provost of our intention to form a union. After receiving no reply for two weeks, we filed a petition with the National Labor Relations Board (NLRB), asking them to hold an election to formally certify our union. The NLRB held hearings over eight sessions on our petition. At the same time, we organized a public relations campaign including shows of support from Barnard alumnae, Barnard students, and New York elected officials, all asking the administration to respect our choice to unionize. As a result of our campaigning, we secured an agreement from the administration that it would withdraw its challenge to our union and remain neutral during our election, in return for which the union agreed to exclude certain ranks. Fall 2015: The NLRB held a mail ballot election, in which the Barnard contingent faculty voted overwhelmingly (114 Yes – 11 No) to certify the union.